"A Community of Language Learners"
When I arrived in Bloomington, I honestly was not sure what to expect. I am not from the Midwest, nor had I ever been to a large state university, and I certainly had never enrolled in a long-term summer program before. However, I had been studying Russian for three years already and knew the impact that several months without practice could have on my learning. The Summer Language Workshop seemed like a great opportunity to keep improving. It turned out to be much more. Studying was, of course, a large part of the program. We had class every morning from 8 am to 12 pm. This included an hour of phonetics or listening (depending on the day) and three seminar-style hours, in which our discussions ranged from Russian slang to the media and the works of various writers. By the end of the summer, my sixth-year-level class had completed two fifteen-page research papers, written several smaller papers, and read countless articles (all in Russian, of course). We also had the opportunity to attend clubs, lectures, and other events in the afternoon. These “after-class activities” ranged from career presentations to art demonstrations, literature and music clubs, and tutoring sessions. One of my favorite activities by far was the Russian Language Table, where professors and students studying at all levels had the opportunity to come together and interact over lunch while speaking Russian. My language capacity undoubtedly improved thanks to my classes and these experiences. 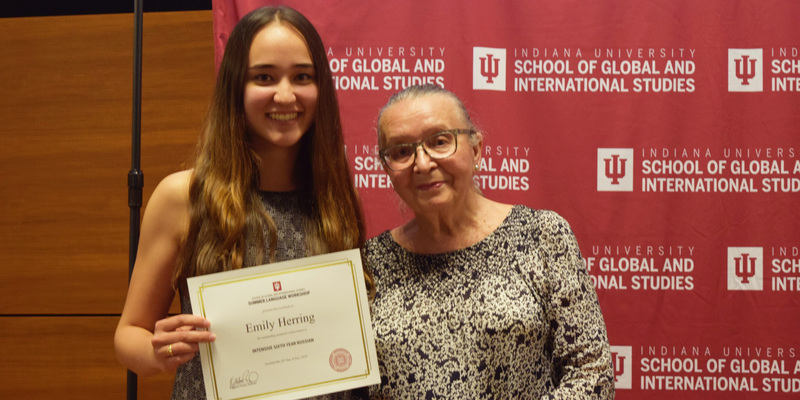 When looking back at my summer at IU, though, I would say that the Workshop turned out to be more than just a way to continue learning Russian: one of the things that I remember the most is the people that I met. Not only did many of my classmates and I become close, but from the first moment that I stepped foot on IU’s campus, I was also lucky enough to meet the many wonderful people running the Workshop. The program is small enough that the administrators and all of the Russian professors knew my classmates and me by name, but large enough that there was still plenty of people to get to know. Whether it was going to a restaurant with our professors, celebrating my birthday with new friends, going to the gym with people from my dorm, or enjoying the nearby outdoor pool and county fair with classmates, even the small moments became memorable thanks to the people that I met. I really think that that is the special thing about the Summer Language Workshop – it is a place where people who love languages can come together to study and share experiences that are hard to find elsewhere. (There is just something about studying a language intensively that brings people together.) While I may not have been sure what to expect at first, I am really thankful that I had the chance to study at Indiana University this summer. Emily Herring with Russian Level 6 instructor, Anna Sharogradskaia.